It is estimated that ninety-percent of road traffic deaths occur in low- and middle-income countries. While the global rate for road traffic deaths is 17.4 per 100 000, there is great disparity by income, with rates more than twice as high in low (24.1) - and middle-income (18.4) countries than in high-income countries (9.2). When looking at road traffic deaths by type of road user, almost half of all deaths globally are among the most vulnerable – motorcyclists, cyclists and pedestrians. This is of particular importance in emerging economies where urbanization is rapidly escalating. Urban areas usually involve a high concentration of pedestrians and cyclists. Many low- and middle-income countries, urban roads are often built without sufficient planning to take into consideration the needs of vulnerable road users, thus increasing the risk of road traffic deaths. By region, Africa continues to have the highest road traffic death rates (26.6 per 100,000 thousand), followed by Eastern Mediterranean countries (19.9), Western Pacific region (17.3), South-East Asia (17.0), and the Americas region (15.9). The European region has a rate below the global average (9.3 per 100,000 inhabitants, as compared to the global rate of 17.4). The 2030 Agenda also calls for “Making cities and human settlements inclusive, safe, resilient and Sustainable”(SDG 11) and sets as a target to “provide access to safe, affordable, accessible and sustainable transport systems for all, improving road safety, notably by expanding public transport, with special attention to the needs of those in vulnerable situations, women, children, persons with disabilities and older persons (Target 11.2)”. - Youth and other road users - college and university students. - Submit necessary documents on time, i.e., application forms etc. - Actively participate in the training program. - Be fluent in written and spoken English. - Application without the required documents will NOT be considered. - Participation is subject to approval of the application by UNITAR CIFAL Jeju/JITC. - Selected applicants will be notified individually. - UNITAR CIFAL Jeju/JITC provides a LIMITED financial assistance with the airfare to Jeju-do, Republic of Korea. 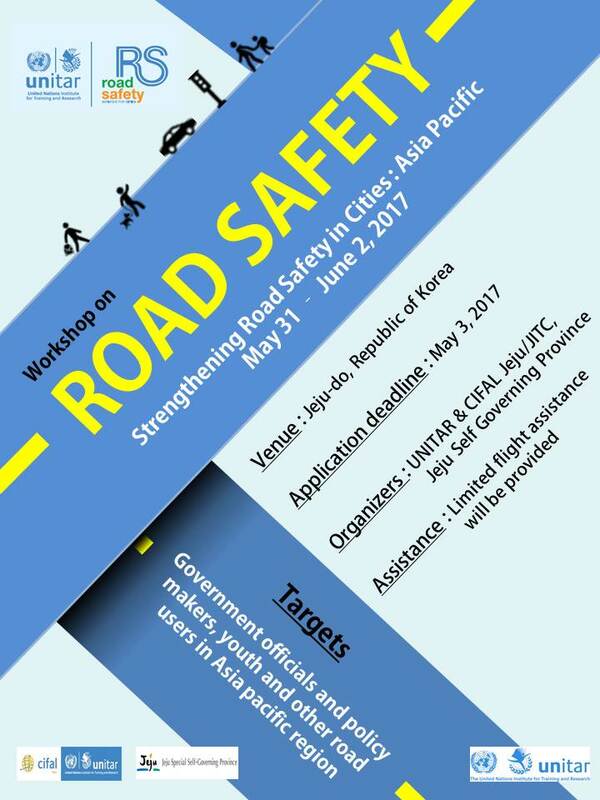 - Local expenses (transportation, accommodation and meals) during the workshop will be covered by UNITAR CIFAL Jeju/JITC. - All other expenses (local transportation in their country, visa fees) are the responsibility of the participants.